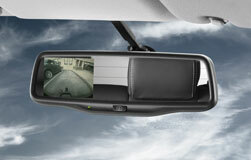 Need a reversing camera installed to your car or van? look no further we have number plate light cameras and high level brake light cameras. The number plate light cameras simply replace one of the number plate lights with a redesigned light that has a camera added, This setup looks very original fit and keeps the vehicle as neat as possible. We offer a massive range of LCD colour screens the most popular type is the rear view mirror which looks like a normal mirror until you put the car into reverse then half the left hand side of the screen then comes to life with a full image of the rear in full colour. These reversing cameras can also be linked into many original fit multimedia screens on the dash, A module is required to do this but you can’t be this set up in terms of how sleek and factory fit it looks. All the cameras we use are high quality and will last for many years of hassle free service, all cables are run behind the vehicle trim out of sight.